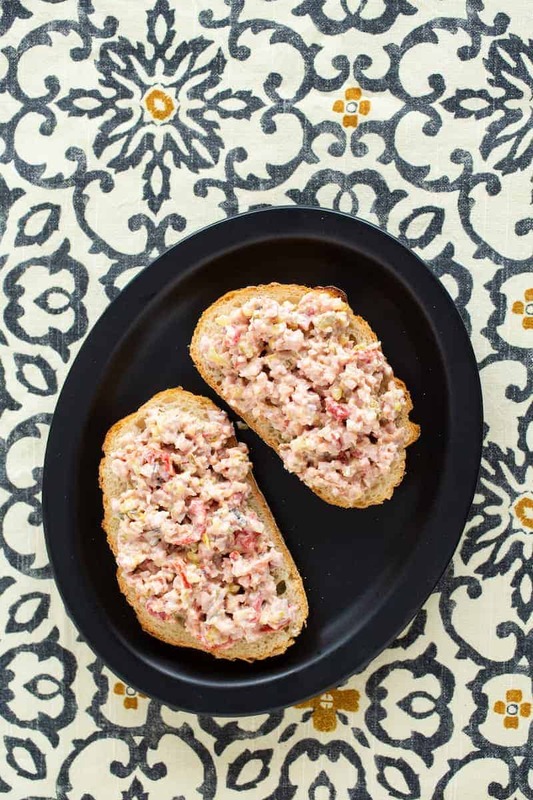 What to Do with Leftover Ham: Make Ham Salad | Good. Food. Stories. What Am I Gonna Do With This Leftover Ham? 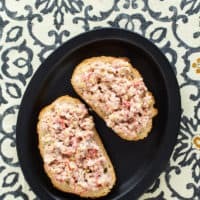 Make Ham Salad! Do you have any good ideas for using up the rest of my Easter ham? Seriously. As someone who held a ham in her freezer for an entire year, terrified by the prospect of finding a way to eat it all/pawn it off on friends, I’ve been in your shoes. And my eventual solution for that particular ham—offer it up as an entrée at a friend’s annual holiday party—isn’t something that works for everyone, especially since said ham was likely the main event at your Easter holiday feast one day ago. If yours is a bone-in ham, the smart thing to do with that Flintstones-esque knob is to make soup. Amber at Bluebonnet Baker gilds the lily by adding bacon to her ham and bean soup. Shaina at Food for My Family does a ham, potato, and beer cheese soup that can easily be adapted to get rid of any extra mashed potatoes you’ve got hanging around. But say you live with a man who hates soup (ahem) or you can’t be bothered to simmer one more thing after expending all your energy on the Easter feast. That’s when ham salad swoops in to save the day. 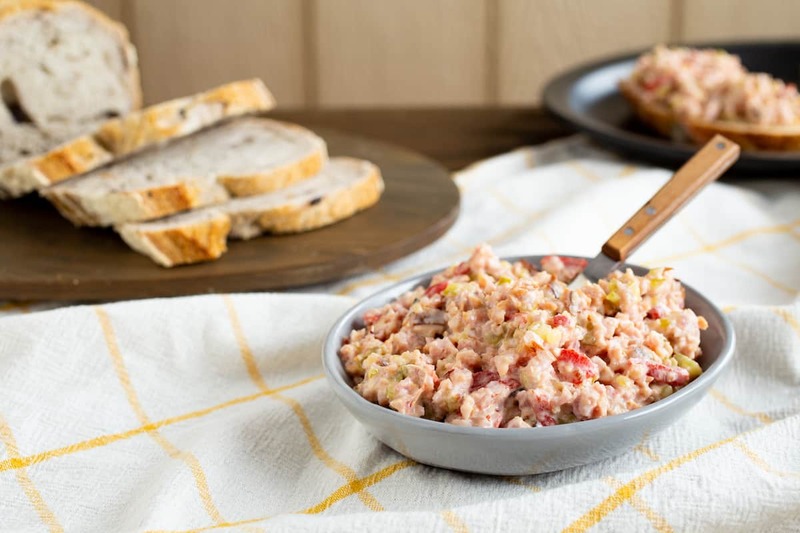 Like chicken or tuna salad, ham salad is one of those cold, mayo-bound sandwich fillers that contain little to no vegetable matter (let alone a piece of lettuce). Hey, what else are you going to do with the ends of your chipped chopped ham but throw together a nice ham salad for the deli case? Some versions add hard-boiled eggs to the mixture, which is a clever way to double up on dealing with leftovers, but I’m a purist when it comes to my ham salad and gotta do things the western PA way. More specifically, the DeLallo’s way with only ham, mayo, sweet pickles, and pimientos, ground finely to a spread instead of the chunkiness you’d expect from chicken or egg salad. 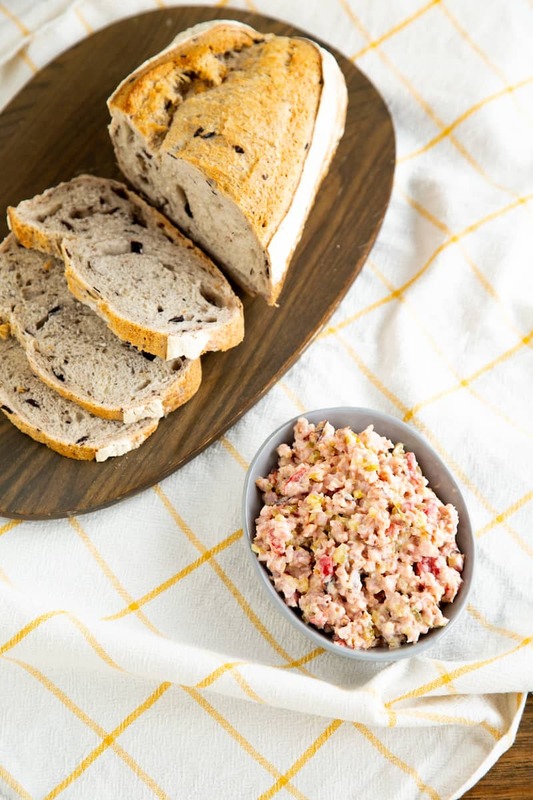 Though I will eat it in conjunction with hard-boiled eggs or deviled eggs, most of the time I prefer my ham salad with no other accompaniments but bread. But it’s got to be good bread, and if you can find it, olive bread matches ham’s sweet-saltiness note for note. This recipe, incidentally, would make excellent picnic fare should you find yourself hiking in Arches National Park near Ham Rock (my favorite rock formation in the park, for obvious reasons). Maybe next Easter you can forego the family feast entirely for a more al fresco experience? So you've got a lot of leftover ham from your Easter meal. Why not make ham salad to help use it up? It's a tasty alternative to tuna or chicken salad. Pulse the ham in a food processor until it's chopped into a coarsely ground consistency. You don't want to turn it into a paste or a puree; there should still be a distinct ham texture to it. Transfer to a bowl and stir in the mayonnaise, relish, and pimientos.